Chromebook Ethernet Adapters allow you to connect a Chromebook to a wire Ethernet connection. Many people ask, is Chromebook capable of connecting to the internet via LAN or ethernet port? Especially in areas where Wi-Fi coverage is spotty, it may be necessary to connect a Chromebook to a wired internet connections (LAN) via an ethernet port. 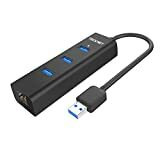 A Chromebook USB Ethernet Dongle is essential in these situations and will allow you to connect to the internet in the fastest way possible. To do this, it is necessary to find a Chromebook compatible ethernet adapter. One of the best things about ChromeOS is that it’s a plug-n-play OS. Since you can’t manually install drivers/programs to make something work, things either work or they don’t. Luckily, almost all USB ethernet connectors will work on ChromeOS. To get more detailed steps on how to connect to a wired network with a Chromebook, please visit Google’s Connect to a wired network page. This will show the instructions on how to connect to the internet with an Ethernet cable in ChromeOS. Yes, you use an ethernet connection with your Chromebook. When Wi-Fi is unavailable or unreliable, it may be necessary to connect your Chromebook to Ethernet to access a reliable Internet connection. If your Chromebook model doesn’t have a built in ethernet port, you can buy an USB to ethernet adapter. 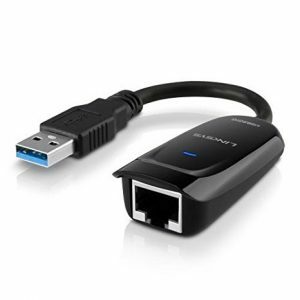 USB to RJ-45 Ethernet adapters provide Chromebooks and other devices with no Ethernet port access to Internet connections. They are available from multiple vendors, small in size, and cost from $10 to $30. It might be cheaper to just buy a wireless router or try the one piece model you see below. If you really need to connect your Chromebook to an Ethernet port, this will be the best option. Using a USB 3.0 Ethernet Dongle will be the fastest option, but it will not be the end of the world to use a non USB 3.0 ethernet dongle. Chromebooks feature both USB 2.0 and USB 3.0 ports, you may want to select an Ethernet adapter that takes advantage of USB 3.0. Again, since it is an adapter, downloading software is unnecessary. Just plug and play – Chrome OS will automatically detect the adapter and connect to an Ethernet connection in seconds. This is why getting a Chromebook USB Ethernet adapater is great for many people who might need to use a wire Ethernet connection once in a while. In the future though, more and more networks are going wireless so a Chromebook ethernet adapter is something that could be pretty obsolete in the next few years. The first step will be finding a Chromebook compatible ethernet adapter. Next, make sure your Chromebook is connected to the Internet router with a working Ethernet cable or USB adapter. Then, click the status area, where your account picture appears. If your Chromebook is connected properly, you’ll see the connected icon . If it’s not connected, you’ll see the disconnected icon . If this is not the case, you might want to try a different router, USB Ethernet Dongle, or ethernet wire to connect your Chromebook to the internet via an ethernet cable. There should not be that many issues connecting a Chromebook ethernet dongle. There are many different Chromebook compatible ethernet adapters. These will allow you to connect a Chromebook to a wired Ethernet connections via a USB dongle. Below are some of the best USB ethernet adapters for Chromebooks that work with ChromeOS. Plugable USB 2.0 to 10/100 Fast Ethernet LAN Wired Network Adapter for Chromebook – Full 10/100 Mbps Fast Ethernet performance over USB 2.0’s 480 Mbps bus–faster than most wireless connections. 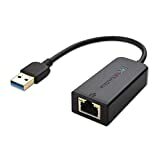 If your computer or tablet has an micro USB port, please consider using Plugable USB2-OTGE100 Ethernet adapter. As more Chromebook Ethernet Dongles are added, this page will be updated.